Last summer I was in Paris researching a book on Blaise Pascal when the report of a miracle caught my eye. On March 24, 1656, Pascal’s niece was suddenly cured of a painful eye abscess after she applied a relic of the crown of thorns to it. After investigation, the Archdiocese of Paris declared the alleged miracle worthy of belief. Commentators have pointed out that the “miracle of the thorn” took place in a Parisian Catholicism with intense devotion to the crown of thorns, housed in the luminous Sainte-Chapelle. When I attended Mass at Notre Dame the following Sunday, a bulletin announcement leapt out. On Friday, the cathedral would host the veneration of its relics of the Passion. An ancient devotion had suddenly been revived. When I entered the cathedral that Friday, two-thirds of the nave was filled with pilgrims. As the bell tolled three, a procession brought the relics up the aisle led by Knights and Ladies of the Holy Sepulcher, resplendent in their capes and mantillas. Dressed in a blue alb, the cantor led us through a series of psalms sung antiphonally. The piercing Miserere brought many to tears. Lectors read from Isaiah, St. John and Paul Claudel on the blood of the cross. A priest briefly preached on atonement. Before the veneration, thurifers raised a cloud of incense over the relics. The knights then held the relics up for veneration at the foot of the altar as the ladies acted as ushers. We bowed and kissed the gold-encrusted glass globe housing the visible crown of thorns. Many audibly wept. At the end of two hours, pilgrims still crowded the aisle to await their turn. Superstition? Unlikely. I was not the only one in the congregation who doubted that this was the actual crown worn by Jesus. The service program chastely informed us that “scientists have arrived at no consensus on the historical provenance of the relic.” There was no special glow. Nostalgia? Undoubtedly. The crown we venerate was the supreme devotional object of medieval Catholicism. As we kiss it, we touch the faith of the crusading Saint Louis in a church triumphant. We also retrieve the piety of the church’s long 19th century, with its graphic devotions to the cross, now all but disappeared. And yet. The service is a child of the Second Vatican Council. The readings are in French, not Latin. The congregation sings one vibrant psalm after the other. The lay knights, ladies, lectors and cantor are the key ministers. Off to the side, the priest seems an appurtenance. Notre-Dame is not only the site of the church triumphant’s rose window; it is also the boxing arena between the church and a persecutory modernity. Here in 1793, an actress posing as the Goddess of Reason proclaimed the death of Catholicism and the dawn of deism. Here in 1804, Napoleon crowned himself under the gaze of a wavering Pius VII, uncertain not only about Napoleon but also about the church’s posture toward this new type of secular state: refusal, surrender or the labyrinthine path of accommodation which Pius ultimately chose. This veneration service is about the need to spend time with Jesus crucified. Postconciliar reformers often emphasized the need to replace the lachrymose preconciliar focus on the Passion with a new stress on the Resurrection. But the felt-board Alleluias always sounded wan. As we kiss the crown of thorns we affirm the sober Christian truth: we are redeemed sinners. The tears of the pilgrims spring from the recognition of our unfathomable sin and God’s unfathomable mercy as we face the cross head-on, without distraction. The veneration of the crown of thorns is also an oddly postmodern act of worship. We do not simply speak about the cross or pray about it or even sing about it. We kiss the cross. We use that most intimate corporeal gesture to express gratitude and sorrow as we embrace Jesus crucified. It’s about the body: the bloodied body of Jesus and our own lacerated body as we march, genuflect and kiss under the vaulted roof. An ancient dance of adoration has broken up through the tile floor. This Lent, Notre Dame is holding the Passion veneration weekly rather than monthly. In that most skeptical of neighborhoods, beholding the wood of the cross is suddenly avant-garde. “O Sacred Head surrounded by crown of piercing thorns, O Bleeding Head so wounded, reviled and put to scorn. The power of death comes o’er you, the glow of life decays, yet angel hosts adore you and tremble as they gaze!” I found “Via Crucis” by Jesuit scholar John J. Conley a heart-warming Lenten meditation Faith-enhancing, enlivening my personal devotion to Christ crucified. It is piously believed that the Sante Chapelle in Paris houses the Crown of Thorns mockingly placed on Jesus’ head by thugish soldiers, on that shockingly disgraceful Holy Thursday night, into early Good Friday morning. It makes me shudder to think what the Lord went through at that time, with the worse yet to come! The well documented healing of Pascal’s niece following prayer of a painful eye abscess seems to support the authenticity of the above-mentioned Crown of Thorns miracle. The veracity of Faith surely authenticates the miracle, for in the final analysis it’s only through Faith that the miraculous happens. God is an equal opportunity provider and Divine equality, opportunity and provisionality makes Faith tangible and miracles happen, even if an object of devotion is not exactly what it claims to be. God just needs Faith to do His "thing!" Everyone in some way or the other is given their “crown of thorns” and one’s personal crucifixion goes into full swing ad infinitum it seems. Why? St. Paul gives a good reason saying that somehow, we complete through our suffering, whatever is lacking in the suffering of Christ. Of course the sufferings of Jesus lacked nothing and Paul’s teaching simply focuses on the awesome reality that through our suffering we become one with Christ and he with us! As a practical example I bring to light what a recently deceased Bishop friend said about his terrible suffering, calling the experience, “the greatest thing I’ve ever done!” How encouraging. Human suffering is absolutely horrendous and the Passion is incalculably more shattering! To think deeply about it can be soul-shaking especially during Lent. Fr. Conley’s vivid reminder makes one cry out “Thank you, Jesus!” Once I said to the Lord in the midst of suffering, “Why me?” Grace immediately responded imaginatively , “Why not You, Whimpy?” Imaginatively once again I imaged Jesus on the Cross, which shut me up fast and had to say, “Lord, you win!” The Passion, Death AND Resurrection of Jesus mind boggling, yet wonderous! Again, Fr. Conley, THANKS! If I may,please allow this little addendum to my post above on "Via Crucis." The holy Capuchin Brother, St. Conrad of Parzham liked to say, "The Cross is my book. One look at the Cross and I know what I have to do!" That says it all! This article also appeared in print, under the headline "Via Crucis," in the March 25, 2013 issue. 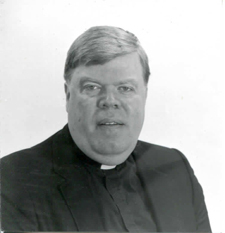 John J. Conley, S.J., holds the Knott Chair in Philosophy and Theology at Loyola University Maryland in Baltimore.